We are actively soliciting corporate sponsors who are willing to help partner with us to sustain our goal of excellent academics and educational enrichment programs through corporate sponsorship of the school. Please help us keep educational levels high for the children of our Oakland Chinatown school. 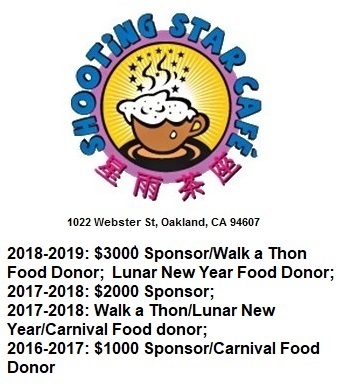 $500: Company name and logo displayed on the annual Walk-a-thon and Spring Carnival print promotional materials distributed to our 700+ families and posted throughout the community. $1200: In addition to the above, Company name and logo will be featured on our school’s website for the entire year. The website receives ~ 550 unique visitors /month and 3000+ views/month. Interested in partnering with GDP to increase your sales? GDP nights at restaurants and stores is one example of an effective marketing strategy. Donations of playground/school supplies or other items works too! Contact us directly to craft a campaign that will fit your business perfectly!